Standing on Crawford Cliffs overlooking the AMC Highland Center, I noticed something I had never really paid attention to before. As the last snows of winter were melting from the mountaintops, the trees below were just beginning to bud. Looking with a little more attention I realized that each tree’s buds gave the whole tree the faint colors of autumn, with some red, others yellow, orange and green. It was as if they were giving a preview of their more vibrant fall colors. But these colors won’t last long. Soon they’ll all be that light green of late spring. 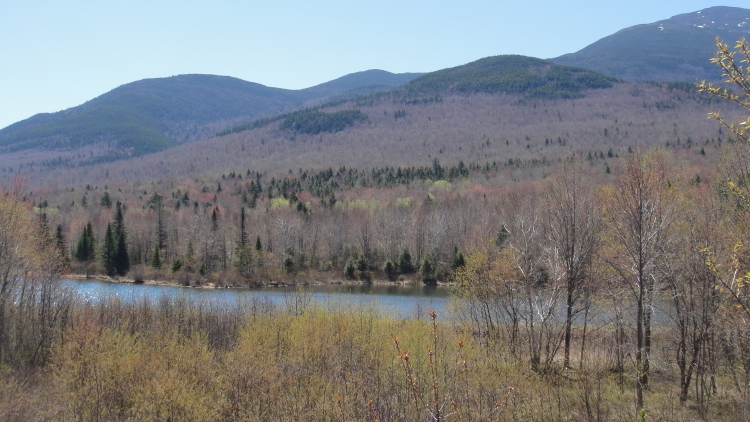 If last year and this are any indication, the month of May is a prime season to explore New Hampshire. Maybe the warm, sunny weather is the result of global warming. Whatever the reason, it means it’s a perfect time to get outdoors. Bugs are few, days are warm and long, and the woods are full of wildflowers. Carol & I are staying two nights in the lovely town of Jefferson NH and, as it’s mid-week, there are few others around. She is content to find a beautiful spot to stop and paint all day and the numerous waterfalls filled with snowmelt are today’s muse. I’ve taken the time to do a few relatively easy hikes, yesterday in the Crawford Notch area and today up Mt. Starr King, using the trail that starts just behind our B&B. This trail is pretty well-used because it leads to Mt. Waumbek, which, clocking in at 4,006 feet, is on the checklist of everyone trying to “do” New Hampshire’s 4,000 footers. The trail to the top of Starr King is remarkably forgiving, in spite of its 2500 feet height gain. It simply sets off at a manageable angle and maintains the same slope all the way to the top. The top today was still rather snowy but the view towards the high peaks was spectacular. But probably the most enjoyable part was the lower half of the trail, within the deciduous forest before it turns to pine in the higher elevations. The flowers were just getting started with three or four varieties already blooming and the forest floor was carpeted with the trillium and trout lily plants that will be starting their blooming in just a few more days. Since they all grow on the forest floor this is their one chance to soak up all the sun they can. When the tree’s leaves are out in a few more weeks, they’ll all be left in the shade. So this is the best time to see New Hampshire’s other season of color. It’s a little subtler than autumn but worth the trip nonetheless. End of Blog – reading below here may expose you to ads.